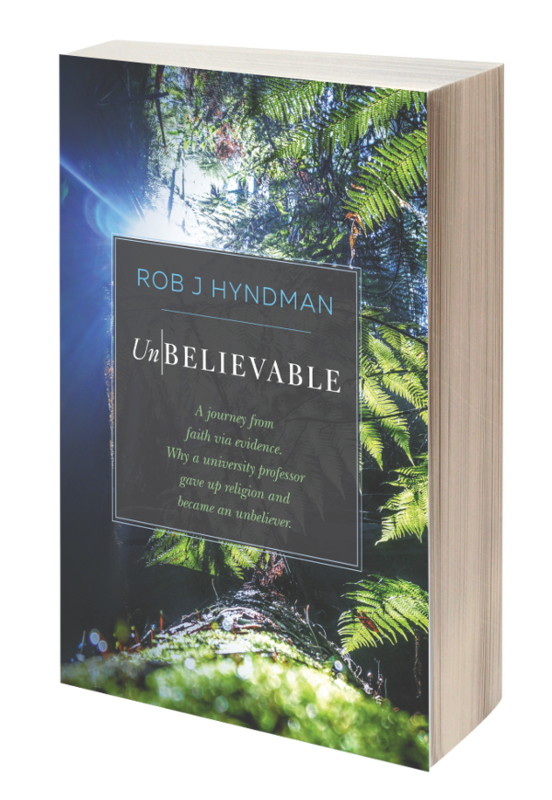 After the disgraceful spectacle of seeing The Christadelphian grant cover article status to a young earth creationist article in the November 2013 edition, there were signs that this could have been a one-off lapse with the January 2014 article on the challenges inherent in preaching to a post-Christian world, and a fascinating article by archaeologist Leen Ritmeyer in the March 2014 issue on the location of Sodom showing a marked increase in the intellectual tone of the magazine. The granting of cover status to an article on the 'blood moon' nonsense however shows that this may not have been a one-off lapse. If we want to brand ourselves as a fundamentalist irrelevancy, this is exactly how to do it. When the Bible refers to signs in the sun, moon, and stars, some argue this refers to the 'political heavens' while others take it far more literally, and look for astronomical phenomena as portents of things to come. Four lunar eclipses will occur on the 15th April 2014, 8th October 2014, 4th April 2015, and 28th September 2015. These all coincide with Jewish festivals, and this has sparked considerable speculation - verging frankly on the hysterical - that this could herald an event of prophetic significance. The Blood Moon hypothesis was not invented by our community, but originated with Mark Biltz from El Shaddai Ministries, and popularised by megachurch pastor John Hagee in his book Four Blood Moons. While hypothesis stand or fall on their merits, and should not be judged entirely by those proposing them, it is hardly unreasonable to exercise caution given the fringe origin of this hypothesis. White seems to overlook that as the Jewish calendar is a lunar calendar, the coincidence of lunar eclipses - which can only happen at full moon - is hardly a great surprise. This alone reduces the impact of the significance of any coincidence of a lunar eclipse with a Jewish festival considerably. The second point is the fact that many of these tetrads do not coincide with anything of significance, leaving blood moon advocates open to the charge of cherry picking events. White seems to be sensitive to this charge because he claims that the fact that only five of the thirty-seven tetrads fall on the first and last dates of important Jewish festivals "sets them apart as specific to critical event in Israel's history." This comes across very much as special pleading, and as mentioned before, the fact that the Jewish calendar is a lunar one makes lunar coincidences entirely expected. The final point of concern is the use of the caveat 'coincide with, or be triggered by'. One would expect that if God was going to go to the trouble of engineering major events in the history of his people to coincide with lunar eclipses, then he would do so down to the day. What does white mean by 'be triggered by'? One day later? One week later? One month later? It is stretching credulity to expect that an event occurring several months after a lunar eclipse is meaningfully associated with that event. All of the blood moons in the first example take place no earlier than 334 days after the declaration of Independence. This is stretching the definition of 'be triggered by' to irrelevance. Only the Six Day War comes close, with the first blood moon occurring around 47 days before the capture of Jerusalem. Given this loose definition of significance, as well as the considerable number of tetrads occurring without any event of significance, one is entirely justified in being sceptical as to the significance of the upcoming tetrad, to put it mildly. Why didn’t God warn them about the Holocaust, or 70 AD, or the expulsion from Rome, or the following persecution? What’s more interesting to me is what you have to leave out in order to believe this theory. Why did God pick the Spanish Inquisition to warn them about and nothing else? And if this was a warning, why did it come a year too late for anyone to do anything about it? Mark Biltz has an engaging style, and judging by the response of those in attendance in the videos, he makes a very persuasive case for his audiences. However, most of those in attendance probably know little, if anything, about the circumstances and appearance of lunar and solar eclipses, so they are easily impressed. Biltz makes two key observations. First, he notes the coincidence of these eclipses with major Jewish festivals. Second, he points out that these four eclipses are in a row (a tetrad). Admittedly, bringing together such factors is rare, though not unique, but there is no suggestion that these eclipses will be otherwise exceptional. The biblical passages that refer to the dimming of the sun (Matthew 24:29; Joel 2:31) and the moon turning to blood (Joel 2:31) speak in very apocalyptic terms, emphasizing frightening things that men experience. The timing of the eclipses that Biltz draws attention to, while interesting, falls far short of the sort of signs that will cause the heavens to shake (Matthew 24:29). It is quite distressing to see even Answers in Genesis display more scepticism on this subject than the flagship journal of our community. 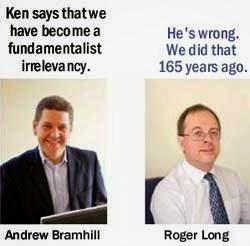 When AiG won't touch something, it is safe to say that it is well and truly a fringe idea. Will the next major event in Israel see her people in captivity and Gog taking the spoils of invasion? While we do not know the date of our Lord's return, the remarkable evidence in data being revealed in today's super-fast highway points very clearly to the end times. I am puzzled both by the embarrassing neologism 'super-fast highway' (why not just say Internet and be done with it) as well as the fact that he felt the need to link this information with the internet. After all, dates of eclipses have been calculate for centuries before the creation of computers. It comes across as a ham-fisted attempt to use the 'modern science proves ancient prophecy' trope, and further underlines the amateurish nature of the article. The major problem is of course what happens if this event passes without significance. While those with a huge amount invested in a belief system will always be able to construct ad-hoc justifications, not everyone is able to do this, and if nothing has happened by 2017 or 2018, long enough after the last blood moon for even the most enthusiastic adherent to admit that the 2014/2015 tetrad had no significance, it is easy to see people losing faith. Editor's Note: The cartoons have been inserted by us and are NOT part of the original article. I hope that the author takes them in the good natured spirit in which they are offered. 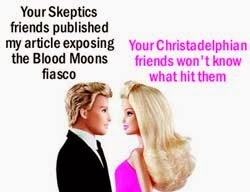 For brevity I shortened the title from "One step forward and ten steps back: The Christadelphian magazine buys into the 'Blood Moon' nonsense" to "The Christadelphian magazine buys into the 'Blood Moon's nonsense" and corrected "Moon" to "Moons." Ken Gilmore is a Christadelphian; NOT a Christadelphian skeptic. PLEASE ALSO DISCUSS THIS ON KEN GILMORE'S BLOG AND THANK HIM FOR HIS WORK. If necessary, mirror your comments on his blog. It's not fair that he writes the articles but gets no thanks, encouragement or comments. Click here.